If you want to stay at a place that will treat you MORE than right and provide the BEST Service you will ever want and have a great stay with Great Fishing, this is the place you want to be...Ed Rezabek, Mark Conner, Gary Holmes, and the rest of the crew.. June, July & Septembe Can't wait to get back! Royal Guide Service of Grand Rapids, MN, provides guided fishing trips on the lakes and rivers of northern Minnesota. Experience the thrill of world class fishing combined with family vacation activities and comfortable accommodations at Bowstring Shores Resort. Our family resort offers 14 housekeeping cottages in a variety of sizes. The cabins are guaranteed clean, attractive and comfortable. You need only bring groceries, towels, and your "can't do withouts" - there is even an on-site laundry facility. We also have 13 Seasonal RV Sites as well. The cozy lodge offers a place to check-out games, grab a book, have a snack and shop for souvenirs. Outside you�ll enjoy the heated swimming pool, updated children�s playground, horseshoes, volleyball or basketball. Bowstring Lake is widely recognized as one of the Top Walleye Fishing Lakes in Minnesota. At just over 9,200 acres in size, Bowstring provides tremendous multi-species fishing opportunities. Walleye, northern, jumbo perch, and crappie can all be readily caught here. And nothing compares to the views of the shoreline as seen from a boat or pontoon. Whether you're looking for a family fishing vacation, a guys or gals fishing trip, a first time fishing experience or that trophy fish, we provide what you need: boat and motor rentals with gas. oil and electric at the dock, full dock service, on-site boat launching ramp, a tackle shop, live bait, large fish cleaning facility with freezer service, resources to local guide service, and even free fishing tips.Many folks prefer to fish off of our 160-foot dock. We've seen some nice fish reeled in right there. This year. 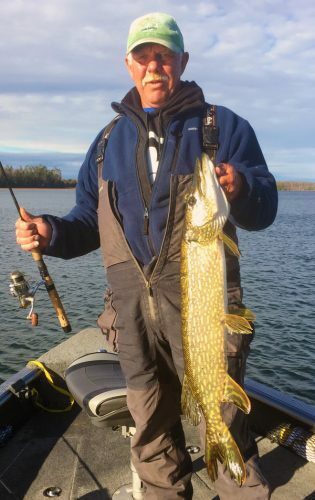 accept our invitation to plan your Minnesota family and fishing vacation at Bowstring Shores Resort and come fish the famous walleye, northern and pan fish waters of Bowstring Lake. Bowstring Shores Resort is a premier Minnesota resort located on Bowstring Lake north of Deer River, Minnesota.